Elite Martial Arts, Krav Maga Training Centres offers our students a great variety of programs and classes. In addition to our award winning Krav Maga program, we also offer a top quality Muay Thai program, Elite Conditioning (30 minute full body workout based on Martial Arts Training), Weapons Defense training. EMA also offers a Woman’s Self Defense workshop hosted at our Toronto Location. The monthly workshop is FREE to our female students as part of their membership. Your first class is always free. Please contact us today to book your trial class. 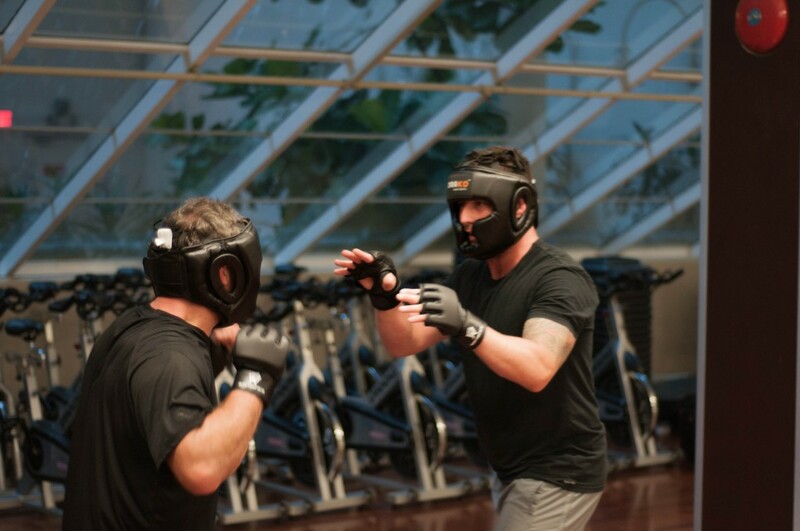 The Krav Maga Basic Class includes conditioning, hand to hand combat techniques and various methods of self-defense. The curriculum will be taught as per the Krav Maga Canada Curriculum. Students will be eligible for belt testing every 3 months with a minimum attendance of 16 classes. Excellence can only be measured by comparison. Compared to the previous Martial arts and clubs I was part of, this school is by far superior for many reasons, but in my opinion the main reason is it’s dedicated instructor (Dan). If you are looking for a serious school to learn the art of real self defense, a school to train hard and have fun at the same time look no further, EMA is the place! The instructors at EMA are knowledgeable, attentive and certified. The facility is clean and well equipped. The gear is in great condition despite the punishment it gets on a daily basis. Fellow students are great; I have had nothing but support and encouragement from them. Elite Conditioning provides students an excellent full body workout that can be completed in only 30 minutes! Students are amazed at how effective a workout can be when done at the proper intensity level, with the right combination of strength training, conditioning and full body endurance. The exercises that comprise the Elite Conditioning are those that are specific to conditioning a student for the demands of Martial Arts training. ALL students are encouraged to participate in this class regardless of physical ability or level of conditioning. You are permitted to work at your own pace. This class is also a great alternative for those who are looking to enjoy the many the health benefits of Martial Arts training, without any contact or need for training partners. The benefits of this class can be listed at great length, but the only way to find out, is to try a class for yourself! I’m a former two sport NCAA athlete who was looking for something more than just joining another gym and lifting weights. I walked into the Elite Martial Arts gym knowing next to nothing about Krav Maga and signed up after my first class. I’ve learn so much in the short period of time I’ve trained at EMA – I have Dan Novak and all the other amazing instructors to thank for that! They always have time to show me how to do things left handed because I’m a southpaw fighter and that really means a lot to me. I go to the gym to stay in shape & learn new skills and I leave this gym every night feeling like a part of a family. Give it a shot and you’ll see what I’m talking about! 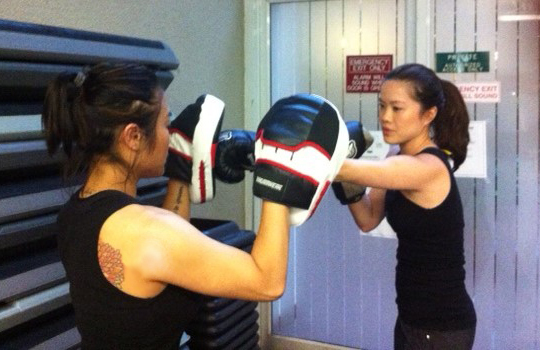 EMA Krav Maga Training Centres offer a female friendly training environment. For the benefit of our female students, the school operates it’s regular classes in a co-ed format where males and females train together. This is an important part of proper women’s self defense training. It is important for females to train vs generally larger males and do so in a safe environment. With that said, EMA is proud to offer an in-depth women’s self defense course that is a 12 part workshop, hosted once a month at the Toronto location. This course allows women to train together in an all female environment where they can learn self defense techniques that encompass the most common attacks used against females. Such techniques include but are not limited to Bear Hugs, chokes, hair pull, wrist grabs, hostage attacks, mounted ground attacks and weapons defense training. The 90 Minute session includes a 30 minute Elite Conditioning session (Full body workout based on Martial Arts training) followed by a 60 minute workshop. In addition to the physical aspects of the class, students will be provided a question and answer session where questions and concerns that are unique to woman’s self defense can be discussed in a safe, non judgemental environment. The goal of this course is to empower our female students with the knowledge and skills to help them feel confident in any situation, both in and out of training. This course is a complimentary add-on as part of your monthly membership at EMA Krav Maga Training Centers. Private lessons are available upon request. These classes include one-on-one training with an Instructor as well as the opportunity to discuss individual progress and goals. Classes can be purchased by blocks or individually at a competitive rate. Classes are scheduled based on Instructor/student availability. Seminars are available to your private group or professional organization. Whether you are a private group of civilians looking to try an exciting new activity or a group of professionals working in the field of Law Enforcement or Private Security, we can provide you with a seminar that will meet the needs of your group. Please contact EMA Toronto with your inquires for a seminar booking. We will cater the seminar to your group’s specific needs. Organizations that fall into the following: Police, Corrections, EMS, Fire & Rescue and Private Security Companies, will be extended a professional courtesy rate. There is also a courtesy rate for those in these professions who wish to sign up for a monthly membership. EMA Toronto believes Krav Maga training is of vital importance to individuals that fall into these professions.